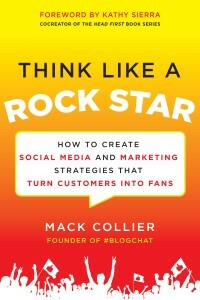 An Amazon Bestseller and the most requested McGraw-Hill publication ever submitted to NetGalley, Think Like a Rock Star is for any brand that wants to learn how to cultivate passionate fans that drive real business growth. Every single chapter has detailed, step-by-step instructions showing you exactly how to create a fan-centric brand. Tired of reading books that are long on ‘why-to’ and short on ‘how-tos’? Then you’ll love Think Like a Rock Star. An entire chapter with detailed, step-by-step instructions showing your brand how to respond to customers online, especially customers that are leaving negative comments about your company online. Including multiple case studies of businesses that correctly and incorrectly handled criticism from customers, this chapter shows you not only how to respond to angry customers, but to do so in a way that can actually convert them into fans of your brand. How to design a content strategy that focuses on The Bigger Idea and cultivates fans of your brand. Creating compelling content is an area that many brands struggle with. I show you what the three methods are to creating compelling content that your customers will find value in, and that will convert them into fans. How to structure an Influencer/Blogger outreach program, and a detailed look at the advantages and disadvantages of these programs versus connecting with your fans. The exact blueprint for creating a fan-centric brand. Everything is covered, right down to internally and external staffing, core responsibilities of each employee position, everything. Additional sections cover creating and launching a brand ambassador program, even a section on how to measure the ROI of your efforts. Hopefully by now I’ve sold you on why you should buy Think Like a Rock Star. But if you still aren’t convinced, email me and I will be happy to send you the Introduction from the book, which will give you an idea of what it’s all about. Also, if you would like for me to present Think Like a Rock Star at your event or do a workshop on how brands can connect with their fans, please email me for pricing and availability.